Hop aboard the Sun Princess in Fremantle and take in Geraldton, Bali (Padang Bay), Broome, scenic cruising on The Kimberley, Darwin, Port Douglas, Townsville, Brisbane and disembarking in Sydney. "Sydney has welcomed not one, but three superliners to its Harbour this morning - a sign of the enduring strength of cruising in the Australian tourism industry. The parade included the 116,000-tonne megaliner Diamond Princess, the popular 77,000-tonne superliner Sun Princess and PO Cruises' latest superliner, Pacific Jewel." Sun Princess departs Tuesday, September 14, 2010 and returns Friday, October 1. You can avoid disappointment and save up to 53% on fares if you book early. 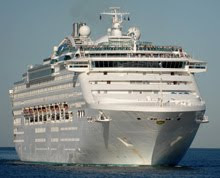 To book a 2010 cruise to Sydney visit cruisesalefinder.com.au.